snowdeal.org > ex machina: organic "inside baseball": how a maine blueberry farmer increased the supply of organic stonyfield yogurt. organic "inside baseball": how a maine blueberry farmer increased the supply of organic stonyfield yogurt. we're big fans of stonyfield farm yogurt and for reasons that odin won't divulge it's the only brand of yogurt that he'll eat which is a happy coincidence since my employer, organic valley supplies stonyfield with the organic milk that makes their yogurt so yummy. 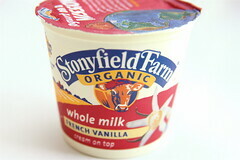 so, if you like supporting the organic valley mission feel free to run out and buy stonyfield yogurt :-). and while it's sometimes been challenging to find their yogurt on the shelves in the past due to supply constraints, they recently announced a big increase in their organic product line and are buying nearly 50% more milk than in 2006. while i can't reveal specific numbers, it's 50% more than an already big number, which is great news for the organic valley farmers. and why, you might ask, is stonyfield suddenly able to get so much milk? in large part, it's because of a maine blueberry farmer who owns a solar-powered computer and an outhouse outfitted with a stained-glass window who won a lawsuit claiming that some regulations on organic milk were too lax which led to a rush of dairy farmers switching to organic last spring so they could complete the year long conversion before the more rigorous ‘‘harvey rule" takes effect in june. ( incidentally, getting a flood of milk in june isn't necessarily the best timing since demand for milk seasonally slumps in the summer - yes, even organic consumers switch to sugary soda and whatnot in the summer ). i suppose since this is "inside baseball" it's worth noting that certain readers primarily on the east coast of the u.s. might see stonyfield milk on the shelves which is not made with organic valley milk but rather is produced and marketed by hp hood.